Jewish mathematician, said by certain Mohammedan authors to have first established the Jewish calendar. He is mentioned by Al-Biruni (972-1048) in his "Chronology of Ancient Nations"; and this account is repeated, almost word for word, in Al-Maḳrizi's (1364-1442) topographical history of Egypt. Steinschneider has connected him with a certain Andrazzur ibn Zadi Faruḥ, a famous Jewish astronomer mentioned by Al-Kabiṣi, the tenth-century Moslem astrologer, and by Abraham ibn Ezra in his "Sefer ha-Ṭe'amim." The first name seems to indicate that he was a Persian by birth; and it occurs in such varying forms as "Andruzagar," "Alezdegoz," "Alendruzgar." 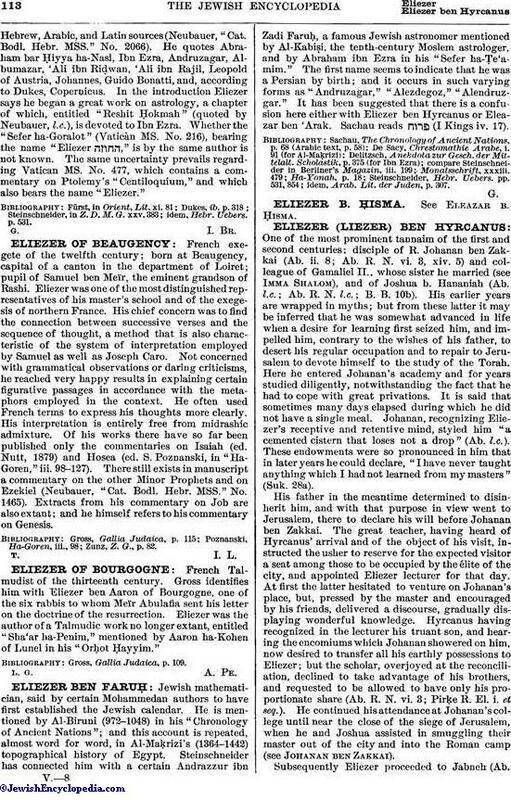 It has been suggested that there is a confusion here either with Eliezer ben Hyrcanus or Eleazar ben 'Arak. Sachau reads (I Kings iv. 17). idem, Arab. Lit. der Juden, p. 307.